A "sformata’ means a little custardy, savory, muffin type thingy. 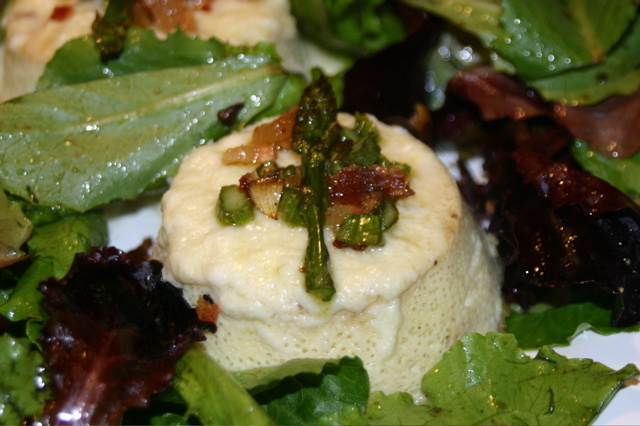 It’s a loose category of savory custards, popular in northern and central Italy. They have lots of eggs and cream around, so it’s logical that they would invent a dish like this. You will need a muffin pan, or some sort of baking cup. I use a silicone form. These things are great, they take high temperatures, almost nothing sticks to them. And they come in very cool colors. Fry the pancetta or bacon until it is crisp. Remove from pan and place on absorbent paper. Sauté the chopped onion in the bacon fat. Remove from heat and sprinkle a few drops of balsamic vinegar on the onions. Be careful, it will splatter. In a separate mixing bowl, whisk the eggs until they get frothy. Add a pinch of salt and a twist of pepper (you’re using your pepper mill, right?). Add the onions and whisk again. Pour the egg mixture into a lightly greased muffin pan or your silicone mold. Take a roasting pan that is big enough to accommodate the muffin mold, fill it half way full with hot water. Place the muffin pan in the water…you’ve now created a ‘bain marie’ or water bath. Place the bain marie in the oven and bake until the eggs set, about 15 minutes. Use your imagination. Go look in the fridge. Little bit of asparagus? Some leek? Some spinach? Sauté it, or roast it or slice it and have it ready to put on top of the sformata when they are done. I like roasted asparagus. Taking the same little cast iron pan that I cooked the pancetta in, lay thin slices of asparagus stem and tip in the pan, add a little olive oil and put in the oven along with the sformatas. On low heat, warm up 4T of milk or cream. Gradually add the cheese and whisk until it melts. If you let this come to a boil, it will coagulate and look gross. It will taste fine, but it will not be pretty. Consider yourself warned. Don’t get scared; just be careful. When the sformatas have set, they will be firm to the touch and they are ready. Carefully turn them out onto a plate, arrange some salad around them, add the cheese sauce, the roasted asparagus and pancetta. Have a glass of wine and enjoy.